I’M really, really quite particular when it comes to laksa as it was one of those dishes I was weaned on when I was reaching that age when a boy becomes a man (though some would say I still haven’t reached that age). Dad would take me to places like Hawker’s Corner and Asian Gourmet in Adelaide and subject me to this fiery yet creamy liquid concoction containing stuff like fried tofu, bean sprouts, chicken and glowing yellow Hokkien noodles (the typical Adelaide-style laksa). These weren’t “backwards coming forwards” laksa either because as Adelaide had a sister-city relationship with Penang, Malaysia, everyone embraced Malaysian food and demanded it to be true (and Don Dunstan would turn in his grave if it wasn’t). In later years I learnt very quickly that this was also a miracle food – it could not only cure hunger but also a hangover. Another reason why I don’t suffer bad laksa is because I know the effort that goes into making it. Making the paste requires the laborious pounding of some 12-odd ingredients in a mortar that are needed just to make the paste. Sure, you could shove all the ingredients in a food processor (I did that once) but it’s just not the same – the blade cuts whereas the pestle pounds and bruises therefore teasing out and blending all those wonderful flavours and oils that is the soul of the paste – and a wise Nonya once told me that Nonya food is all about love because if you are spending hours and hours pounding spices and herbs you must be doing it for love (or you’re crazy). That’s just step one. Then there’s the making of the stock and the sambal. Hell, I even grow my own laksa leaf plant to ensure I have the right stuff. Laksa House in Adelaide’s Market Plaza Food Court off the Central Market makes the typical Adelaide-style curry laksa but I must admit it was with trepidation that I went there. My mate Corey suggested it as we had a big night before and were both in need of the miracle cure. Things looked on the up when I spotted a 2008 UK Financial Times article proudly positioned on the wall near the serving counter written by famous Indian food writer Madhur Jaffrey entitled “In Laksa Heaven”. It was an article about laksa restaurants in Adelaide’s Central Market and Laksa House was, according to Jaffrey “… the best laksa in town”. 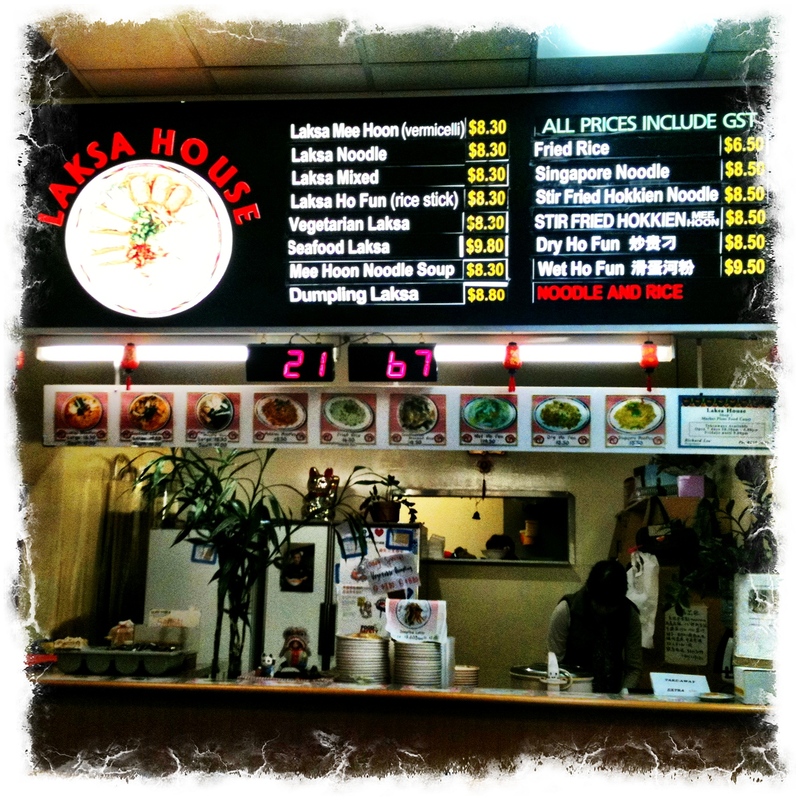 You can get two sizes at Laksa House (small and large) – the chicken is $7 or $8.50 or for seafood $8.30 or $9. You can choose what noodles you want – the best are either the yellow Hokkien or thin rice (mee hoon). There are also beef and vegetarian options (a sign informs vegetarians that no prawn or chicken stock is used). Out is comes – a huge bowl of noodles, fried bean curd, sprouts, chicken sices and shreds of cucumber either submersed or bobbing about in a thick reddish-yellow liquid. I ask for a large dollop of sambal. One whiff of the intense coconut and prawn aroma brings back those boyish memories of yesteryear (but thankfully no flashbacks of the hangovers). The stock is sweet and flavoursome – possibly a combination of both prawn and chicken stock spiced with mashed chilli, dried prawn, onion, galangal and other aromatics. The fried tofu, soaking into the soup squirts its lava on every chew, the chicken is tender and the cucumber gives some respite from the scorching sweet soup. I lapped it up, every last drop of chilli coconut goodness. Like Madhur, I’m was in laksa heaven and cured. What: Laksa House, Market Plaza Food Court (between Moonta Street and the Adelaide Central Market), Adelaide, South Australia. 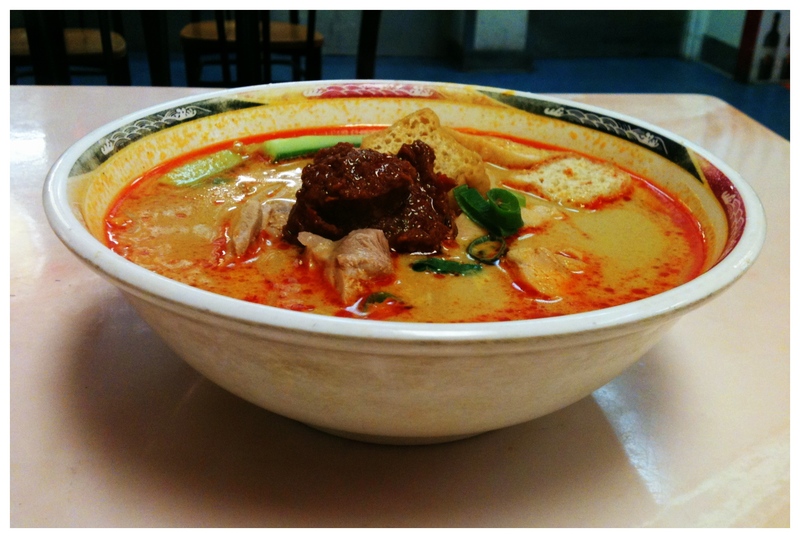 The verdict: Well-priced, substantial and flavoursome, Laksa House possibly does do the best laksa in town (Adelaide). Ate there: 7 & 9 August 2011. This entry was posted in Adelaide, Hawker food, Malaysian, Street Food and tagged Adelaide, Hawker Food, Laksa, Malaysian. Bookmark the permalink. Don’t forget we also went to Malacca Corner in the Central Market….